Visit the “Hebrew and the Humanities: Present Tense” homepage for the full symposium schedule, speaker bios, blog posts, and more. You can reserve your free ticket here for an audience seat at the full day of symposium sessions; please note that conference meals will not be provided to symposium audience members. The Stroum Center thanks the Walter Chapin Simpson Center for the Humanities and Dr. Elie Levy for generous grants supporting this event. We also thank the following cosponsors for their support: Department of Near Eastern Languages and Civilization at UW and the Department of Comparative Literature, Cinema & Media at UW. 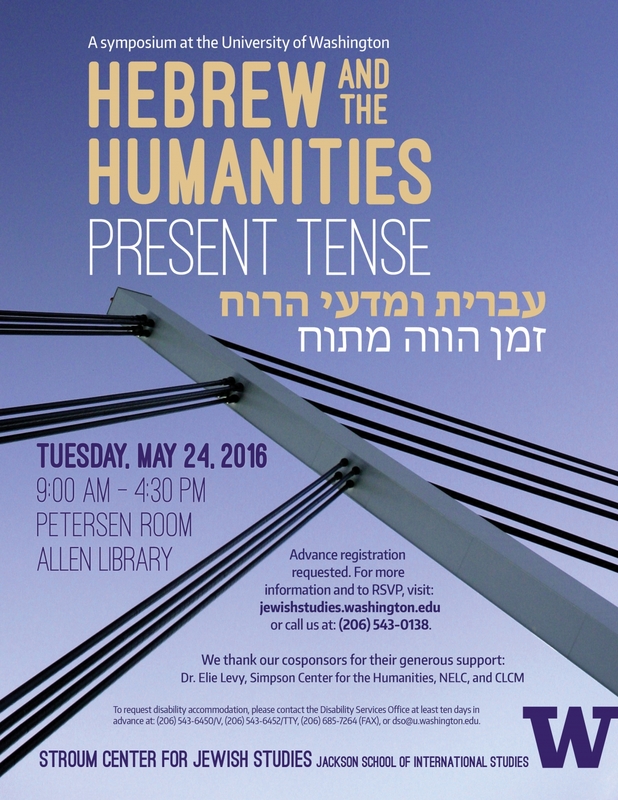 View the official “Hebrew and the Humanities: Present Tense” homepage. Register for Stroum Lecture Night 1 (Dara Horn) and Stroum Lecture Night 2 (Ilan Stavans). Visit Modern Hebrew at UW for information about UW coursework and travel abroad opportunities to explore Hebrew and Israeli culture.